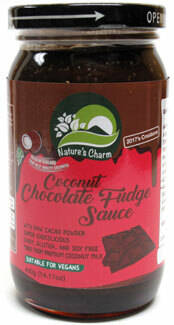 Grab a jar of Nature's Charm Coconut Chocolate Fudge Sauce and experience the new generation of dessert toppings! Made with only a few simple, natural ingredients, this thick and rich fudge sauce is made with raw cacao powder and premium coconut milk for THE best dessert topping you can enjoy! Rich and creamy with a hint of coconut flavor in every spoonful, it's sweet without being TOO sweet, giving you the best way to top off your vegan ice cream, sundaes, cakes, fresh fruit and more. Dairy-free, gluten-free and soy-free. 400g (14.11 oz.) jars are $6.99 each.